In case you haven’t heard from anyone lately- or maybe not even since submitting your application, we want you to know why. We got a lot of applications, and we simply have not had an opportunity to respond to them all yet. Barb is reviewing them in the order in which they were submitted, to determine who has suitable facilities for caring for the ISPMB horses. As she reviews and processes them, she contacts applicants to let them know if they’re approved. Our process has been to try to match up available (gathered) horses with the approved adopters who have requested horses that generally fit the genders and ages of those particular available horses. Over the weeks, as more horses have been gathered and sorted by Palomino and her gang, we have been contacting more of the adopters to start coordinating the picking up of their horses or arranging for transportation through Fleet of Angels or whomever they want. It’s been a bit like solving a huge Rubix Cube. 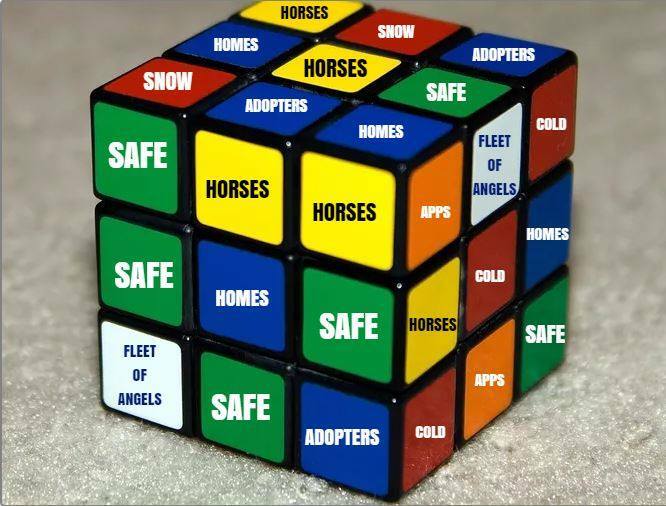 The weather, roads, season, location, and various restrictive limitations set by ISPMB prevented our being able to more quickly reach the maximum number of 270 horses allowed by the State to be adopted. We are actually nearing that number now, we think- although it’s difficult for us to get a total count due to numerous factors over which we have no control. If we are given access to more horses by ISPMB after the holidays, and if the State arranges to let us adopt out more horses, we will be in touch with more applicants as we get to them on the list. Some of you have been contacted, but are still hoping for transport assistance from a Fleet of Angels transporters. Due to all the same reasons, it’s been difficult or impossible for many of them to get to ISPMB to pick up your horses. We, like you, are hoping for a break in the weather after the holidays. The adoption campaign will take a holiday break as of Monday Dec 19, and will resume after the first of the year unless something in the current arrangement changes and we are prevented from saving more of the horses. Thank you ALL for your desire to help save ISPMB horses, for your donations, for your support and encouragement, and for helping get these horses to new homes! If you want to help subsidize costs of transportation, panels, motels for helpers, food, travel, and other costs of doing this huge job, you can send tax-deductible donations to: www.ispmbhorserescuemission.org. Sounds like its moving along. At least there are applications on file and real hope for the horses. I hope all find homes and that woman not allowed to keep any equines. God bless everyone involved in this gigantic challenge. Obviously the advocates’ motivation here is to protect as many horses as possible. Oftentimes the public agencies’ motivations are different. Here is a verifiable argument that we’ve used more than once to encourage public agencies to cooperate, especially if we can get the agriculture folks behind it. At best a slaughter sale horse is going to contribute a couple hundred dollars to a region’s economy. The main economic benefits are gained overseas. An adopted horse will, on average, contribute about $1,500.00 / year to the agricultural economy, about $1,200.00 of which often stays in the region. What bureaucrats have to recognize is that through these efforts, a lot of people will redirect portions of their disposable incomes toward the feed, care and maintenance of their adopted horses – money that would otherwise be likely spent on foreign made consumer goods. In the first ten days since we took custody of the 23 horses, here are the numbers. 6 horses remain with interest being shown, some with applications still needing compliance checks. Financial impacts, based on university studies (Texas A&M and Sonoma State U,) adjusted for Nevada costs. TOTAL ESTIMATED BENEFIT TO NEVADA’S AGRICULTURAL ECONOMY (245 x $1,200.00): $ 295,200.00 – over the anticipated lifetimes of the adopted horses, assuming that they remain in the region. We’re in this business for the welfare of the horses. However there is also very sound economic reasoning to support well-crafted adoption efforts. We have found that when bureaucrats start to dismiss us as a bunch of emotionally driven animal “activists,” we can roll out some serious numbers that often gain their attention. The more horses that are involved, the greater disparity between the paltry economic benefits of selling horses for meat versus placing them with responsible citizens. Money talks, and often it’s the only language that bureaucrats hear. WHG, excellent points. In small rural areas especially, keeping vets, farriers, feed stores and similar in business is a high priority. Since a lot of ag producers disdain wild horses as costly pests, this economic argument should be more widely broadcast. We shouldn’t sell our scruples (or our horses) so cheap! Especially when the net profit per cow in one recent WY study was only around $50 annually, anyone concerned about keeping small towns viable should sit up and take notice. And though harder to quantify, there is added income from wild horse related tourism. One small enterprise (also in WY) regularly grosses around $50k annually for a few weeks of wild horse tourism offerings. And yet I still get requests from ISPMB itself for donations! Maggie, I think the ISPMB can still operate even without any horses, unless and until they are legally shut down. But Icy – the sad thing is, people probably will donate to ISPMB thinking they are helping the horses – horses that are being REMOVED! The money should be going to the rescues that are actively working or the County which is still paying for hay & feed. In this case – sounds like ISPMB is drawing money away from there! Or am I wrong? Maggie, I don’t have the answers. Any income from or for the impounded horses must first go to the sheriffs department/s to cover their continuing costs. However, if ISPMB is still legally operating it seems they could solicit funds for other purposes. My understanding is none of the horses now on site will remain there once the impoundment and adoptions/sales end. I don’t know if they could then bring in other horses and seek funding to support those but the existing horses must not return once they leave, period. If anyone wants to send funds to support the ISPMB HORSES, they should send to the sheriff’s department who will at least have some accountability, or to Fleet of Angels who are helping with transportation, or to another rescue which is solvent, effective, and sane (which is what I did this year). Thats what I figured too! IS – I agree with your comment re donations on Dec 21 100 % !!!! Fleet of Angels could not be a better name for those folks !!!! ISPMB should be shut down – they may have served a purpose in the original rescues from years ago but failed utterly to become a viable enterprise. They should acknowledge this fact and move forward to provide homes for the horses and money to this end. States like Nevada, Arizona, Wyoming, the Dakotas, etc. 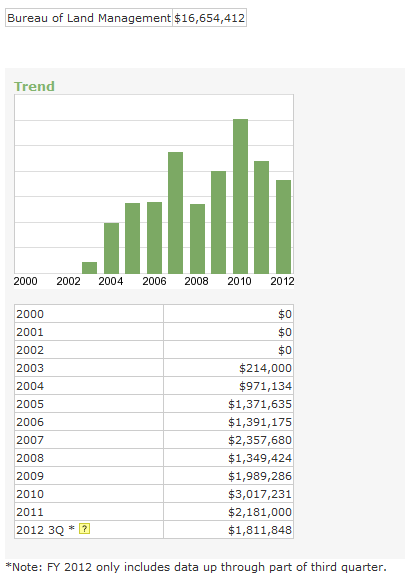 should take a look at WHG’s numbers and move towards a new economy now – while money is cheap – tourism, wind farms, etc. anything but barbarism. Make a future to be proud of not ashamed. Can’t argue with you Rita. Yet today I received 2 emails from Sussman, one a broadcast asking for hay sponsors and another soliciting memberships. It’s surreal. WHG, did the hay sponsorship appeal indicate funds should be sent to the Dewey County Sheriff’s Dept. or to ISPMB? Icy – I went back & looked! Neither of these emails mentions whats been going on & the only address is ISPMB-Lantry! Icy, the tourism issue runs deeper than one thinks. It’s a great deal about branding and the fierce competition for tourists. Leave a bad taste in their mouths and tourists go somewhere else. A few years ago some in the Nevada State Legislature were trying to strip what water wild horses could access way from them. (Yes, thanks to the McCarran Amendment of 1952 the state has control over nearly all the water under Federal lands.) Lots of advocates protested causing one legislator to shoot off his mouth saying that he couldn’t care less what outsiders thought. The next month (and you can look this up) the UNLV School of Economics – that tracks gaming revenues – reported a drop of some $ 152 million, the largest drop in history. The legislature dropped the water bill like a hot, glowing coal. I’d venture to say that nearly all of those people weren’t coming to Nevada to go out onto the range to see wild horses, but they sure as heck stayed away when they felt put off by Nevada’s attitudes. So it’s one of those funny issues that can have a modest positive impact, but a huge negative impact… especially in a state where 40% of its citizens depend one way or another on the hospitality / tourism / gaming sector. In fact one of the region’s major tourism marketing firms even made a video about the issue. WHG, all good. In what seems to be our country turning into a corporation, there will be winners and losers, so in the matter of tourism, if one state isn’t interested or eradicates any and all wild horse tourism opportunities (other than seeing incarcerated BLM horses), tourism dollars will migrate elsewhere. One would hope NV would then take wild horses off their quarters?!? 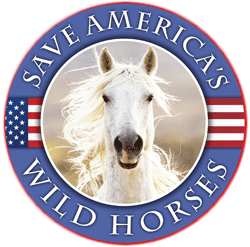 Or other states could start a campaign for people to donate their NV quarters to support wild horse tourism in places which value them. Thirty years ago, I visited BLM’s Palomino Valley wild horse corrals for the first time and saw a palomino foal drown in the mud. Since then, I often visit after heavy rains, just to keep watch. Over time, improvements have been made, but changes reflect human ideas of what’s cost-efficient. Over generations, freedom has taught horses how to survive the harshest weather. In captivity they can’t do that. Last month, BLM-authorized helicopters rounded up nearly 2,000 Owyhee mustangs. Most of those wild horses — staff couldn’t be more specific than 1400 -1600 horses – are at Palomino Valley. Earlier this week I visited Palomino Valley between northern Nevada storms. These horses are so wild, so sensitive to my approach that they bolted, rammed into each other, slipped and sometimes fell in the mud. I saw few mares with foals. Those who were together did their best to stay away from standing water. I am sending hay money to Dewey County – I don’t like the idea of sending money to ISPMB if it cannot be used properly and if I am seeing the evidence of this in the situation at hand. I only wish I had more money……………!!!!!! Besides that I am still hoping that the horses will all be taken away from this entity.